Wang Yangming, also known as Wang Shouren (Wang Shou-jen), is one of the most influential philosophers in the Confucian tradition. He is best known for his theory of the unity of knowledge and action. A capable and principled administrator and military official, he was exiled from 1507 to 1510 for his protest against political corruption. 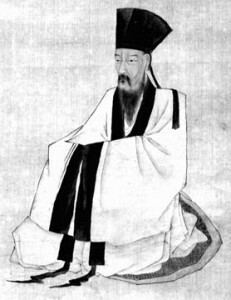 Although he studied the thought of Zhu Xi [Chu His] (1130-1200 CE) seriously in his teenage years, it was during this period of exile that he developed his contribution to what has become known as Neo-Confucianism (Daoxue, [Tao-hsueh or “Learning of the Way”). With Neo-Confucianism in general, Wang Yangming’s thought can be best understood as an attempt to propose personal morality as the main way to social well-being. Wang’s legacy in Neo-Confucian tradition and Confucian philosophy as a whole is his claim that the fundamental root of social problems lies in the fact that one fails to gain a genuine understanding of one’s self and its relation to the world, and thus fails to live up to what one could be. Second, the identification of xin and li brought about significant changes in the understanding of the mind as well. These changes in the understanding of the mind entailed a new philosophical anthropology. The mind -- the unstable entity that was formerly understood in terms of qi (ch’i, vital force) and believed to be vulnerable to evil -- is now conceived as li, the perfect moral entity. This position makes one wonder if the external world does not exist without the operation of one’s mind. However, what Wang Yangming cares about is not (scientific) investigation of the existence of the world itself -- which is a question of modern epistemology -- but the perspective from which we can properly understand our relationship to the world. When Wang asks rhetorically, “Is there any affair in the world outside of the mind?” the message he is trying to convey is that all the things and affairs in our lives exist in an activated state, so that is what we should have in mind when we think about the world. How, then, is the world in an activated state? The practitioners of “vulgar learning” often take the world as something statically “out there.” When they produce factual knowledge, they assume a static world-picture to the extent that they can produce fixed knowledge. However, if we accept Wang’s definition of things as “that to which the operation of the mind is directed,” the real world in our lives turns out to be the experienced world. In other words, the world is not silent, inert, and vacant, but activated and awakened. Indeed, life manifests itself in movements like eating, going to bed, and speaking rather than seeing while stationary. To be exact, we are, in a sense, moving when we are stationary, for we are experiencing something incessantly. Common metaphors of life -- such as passage, travel, voyage, and journey -- are related to this kind of mobility in our life-experience. What are the implications of Wang’s redefinition of the external world? First, knowledge in Wang’s theory of the unity of knowledge and action may not necessarily be the knowledge we conventionally imagine. What Wang meant by knowledge in his discussion of knowledge and action is not grasping information that was “out there” -- which is prevalent in what Wang characterized as “vulgar learning.” What Wang meant was knowledge of how to act in a given situation, as we will confirm in Wang’s statements concerning the unity of knowledge and action. Where, then, does knowledge of how to act come from? This question brings us to Wang’s theory of philosophical anthropology and his notion of liangzhi. Liangzhi is supposed to provide that kind of certainty for action. The English translation of liangzhi is innate knowledge or innate knowing, which suggests that we already possess all the knowledge we need to have. We do not have to spend any time to acquire knowledge. Precisely speaking, we cannot acquire knowledge, for we, as self-sufficient moral agents, already possess it from the very beginning. Thus, it would be nonsense to say that we need to know before in order to act. In this sense, what we mean by “knowing” is not to attain from outside what is previously absent but to experience the operation of our innate knowledge/knowing in the concrete situations of our own lives. “To ‘obtain’ means to get in the mind; it is not infused from without.” From this we can understand Wang’s strange idea that it is only through simultaneous action that one can obtain knowledge. For action is the process of activating our innate knowledge. Thus, Wang said, “Can anyone learn without action?” What we conventionally think of as attaining knowledge is nothing other than experiencing knowledge that we already have. To understand further why Wang conceived of action as a response to a given situation, we need to remember his redefinition of the world. To describe the actual fabric of life that Wang had in mind, we have invoked the sense of movement, which posited an alternative to the more static conception of experience -- one that deceived one into thinking that one stood outside the actual world. For Wang, our lives consist of living in the moment. Leaving aside Wang Yangming's importance in his own time, he deserves attention because of his tremendous, long-lived influence on Chinese intellectual history. Not surprisingly, therefore, important studies of Wang Yangming have been produced all the way up to the present. Araki Kengo, et al, comp. Yōmeigaku Taikei. 12 vols. Tokyo: Meitoku shuppansha, 1971-73. Chan, Wing-tsit. “The Ch’eng-Chu School of Early Ming.” In Self and Society in Ming Thought, ed. W. T. de Bary (New York: Columbia University Press, 1970): 29-51. Chen Lai. Youwuzhijing: Wang Yangming zhuxue de jingshen (The Realm of Being and Non-being: The Spirit of Wang Yangming’s Philosophy). Beijing: Renmin Chubanshe, 1991.
de Bary, W. T. “Individualism and Humanitarianism in Late Ming Thought.” In Self and Society in Ming Thought, ed. W. T. de Bary (New York: Columbia University Press, 1970): 145-247. Henke, Frederick Goodrich. The Philosophy of Wang Yang-Ming. Chicago: Open Court, 1916. Ivanhoe, P.J. Ethics in the Confucian Tradition. 2nd ed. Indianapolis: Hackett, 2002. Shimada Kenji. Shushigaku to Yōmeigaku (Zhu Xi Learning and Yangming Learning). Tokyo: Iwanami shoten, 1967. Togawa Yoshio, et al. Jukyōshi (A History of Confucianism). Tokyo: Yamakawa Shuppansha, 1987. Yang Guorong. Wangxue tonglun (A Comprehensive Study of Wang Learning). Shanghai: Shanghai sanlianshudian, 1990.